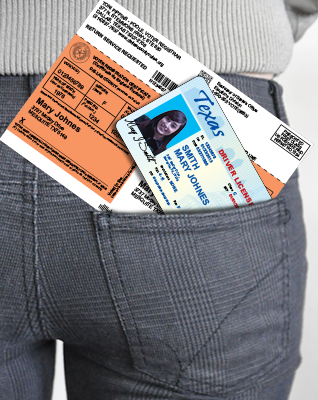 The new Texas voter ID law has sent officials, professors and students scrambling in an effort to comply before the upcoming elections in May and November. Some see the current Texas Voter ID law as nothing more than partisan politics – a way to suppress the Democratic vote. U.S. Attorney General Eric Holder challenged the law, passed in 2011, but due to the recent Supreme Court ruling that struck down key elements of the 1965 Voting Rights Act, the Texas law became effective immediately. The 1965 Voting Rights Act said states with a history of discriminatory practices must seek federal approval prior to changing their voting laws. County election officials are struggling to make voters aware of potential problems with their registration. On Jan. 24, the Dallas County Elections Department mailed 195,000 letters to registered voters whose driver’s licenses didn’t perfectly match the name on the voter’s registration list, costing taxpayers $80,000 in the process. This means roughly 20 percent of legally registered voters could face challenges at the polls. One argument against the law is many people may not have the means to get the proper documentation. While some see the new law as a clear-cut violation of people’s voting rights, others believe it is necessary to eliminate voter fraud. The law could prove problematic for women who have changed their names after marriage. However, supporters believe the impact will be minimal. “I don’t think it will have much of an effect on the students at Eastfield because I’m sure they have driver’s licenses and the proper documentation,” government professor Phoenix Rousseau said. Proper documentation necessary, isn’t the only obstacle for some voters. The new law states that the name on their valid ID must “substantially match” the name on the official list of registered voters. “I voted during the last election,” mechanical engineering major Carlos Torres said. “I thought all you have to do was show up and have your card and you were good. I had no idea that the law changed. Students can visit the County Elections website at www.dallascountyvotes.org to make sure their information is correct before voting.